Mermaid scales beach tote bag. This embroidered tote bag with scales is a must-have for mermaid lovers! The metallic scales are cute and eye-catching. They adorn these totes in multi-shades of blue. The metallic silver trim on the edge of the tote and handles adds a great feminine touch. 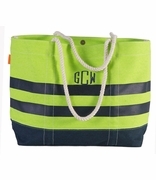 Use this tote for beach or pool, vacation and overnight stays with a friend. This tote is spacious enough to hold everything you need! Personalization included with purchase, name or monogram. NOTE... all personalization will be embroidered with NAVY thread.